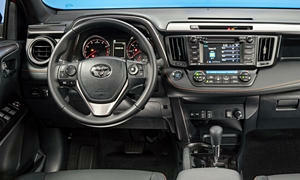 Need advice about a specific Toyota RAV4 problem? See TSBs and recalls for the 2016 Toyota RAV4. Chart based on 25 repair trips. The repair cost chart excludes repairs made under warranty, do-it-yourself repairs, and repair trips that include maintenance. 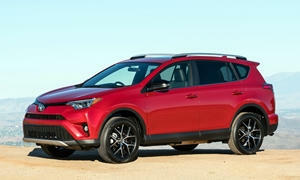 See repairs for all Toyota RAV4 model years. 24000 mi Faulty vacuum pump inside charcoal canister set off check engine light. Charcoal canister replaced under warranty. Car would not start. Jumped twice. Battery replaced. 4000 mi First oil change, some problems with navigational system. System screen will go blank for no reason. 32000 mi Right rear bearing replaced. 21700 mi 4-wheel alignment. After previous repair (transfer case oil leak), the dealer left the steering mis-aligned. Toyota has agreed to reimburse the cost of the alignment. Oil leak from transfer case. Major repair requiring removal of steering rack and transfer case from the vehicle. Covered under warranty. Out-of-warranty cost would have been in excess of $1,000. Dealer had to wait 5 days for parts to arrive. 24000 mi The car had repeated episodes of all the dashboard warning lights coming on with a warning to take to the dealer. At first it seemed to happen when going over a pothole or bump, but it occurred several times without that happening. The dealer was unable to find or replicate the problem and said we'd need to bring it in when it happens so they can see it. We have not had the opportunity to do so. 31000 mi A sensor was replaced. Warnings that systems weren't working..antilock brakes, cruise control, lane assist, etc. 14000 mi Battery would not hold charge, replaced under warranty. 24000 mi Left rear pads near bare metal, right rear 70%. Replaced both rear under warranty. US $48 Lubricated the liftgate mechanism. 17000 mi Text messages from my phone are not being displayed on the head unit. Problem went from non-existent the first year, to intermittent the following six months, to most of the time now. Bluetooth is working and the phone is synced. Dealer installed software update. I removed then re-added my phone to the system. Problem still occurs. 35960 mi Replaced trim pc under roof rack on passenger side. US $130 had windshield replaced, and technology camera requires re-calibration on new windshield. expensive, not covered by insurance either. had prevent. maint (5K) done at same time. 4600 mi Wheel lug stud broke during tire change, was repaired at no cost to me by dealer. 11780 mi JBL radio/GPS/phone unit failed and was replaced under warranty. 21700 mi Power rear door failed. ECU replaced under warranty. 2000 mi Navi/head unit lockups. Head unit replaced. Jun 2016 AM/FM section of Entune not working at 51 miles...System reset? 4400 mi Volume level changes...GPS locking-up. Still having problems and we need to take it back...Wow the fun never ends? 11000 mi Dealer says that volume changes when switching between FM and USB/Sirius are normal. No fix for that. The front end on the radio can't hold a signal. GPS fix will cost $165, to fix problems? Oil change a quart over filled. Aug 2016 HD Radio malfunctioned and dealer determined the radio head needed to be replaced. 5000 mi Rear hatch would not shut automatically. they had to replace ECU in rear door. 9500 mi Rear hatchback motor ceased to open or close rear hatch door after encountering a restriction. Problem is covered under a recall for hatch door control module. Module was replaced under warranty/recall at no charge. 10000 mi Rear door lock recall. It had appeared to act up once or twice. See our lemon odds and nada odds page to see vehicles with no repairs or vehicles with more than three repairs. To see how frequently 2016 Toyota RAV4 problems occur, check out our car reliability stats.